The Air Force is expected to soon open the contest to build the next tranche of GPS III satellites, which is referred to as SV 11+ for space vehicle 11 and everything that comes after. The request for proposals (RFP) should go out between now and the end of September, according to a presentation by GPS Directorate Deputy Director Col. Gerry Gleckel. Air Force Space Command on July 10 announced it was holding an industry day July 20 to update potential contractors. A decision should be made early in FY19, according to the chart (above), which was included in a presentation to a late June meeting of the National Space-Based Positioning, Navigation, and Timing (PNT) Advisory Board, the nation’s top experts on GPS. "It’s going to be a full and open competition for 22 satellites," Gleckel said. "Our strategy is to have a single contractor win that for 22 satellites. We want the stability that goes along with that." Gleckel pointed to the GPS IIF program, which comprised 12 satellites and then the initial buy of just 10 satellites for the GPS III program. "Every time we restart that, it’s billions of dollars in nonrecurring engineering costs," he said. "There’s delay going through the satellite design process and in qualification. We want to get some more stability in our satellites." 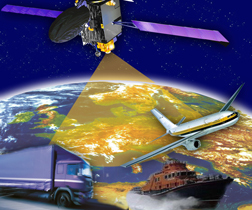 However, locking into a multi-year procurement of nearly two dozen satellites also comes with costs. The Air Force needs the flexibility, he said, to be able to respond to new threats. To do that the Air Force plans to incorporate "tech insertion points." "That’s where we can add additional capabilities into a future flow," Gleckel said. "Again, with the same contractor without starting over, without the costs and time that go along with that — but still allowing us to change with the threats." The Air Force went through a course change before settling on its current direction. Cost is a factor as is frustration with current prime contractor Lockheed Martin. The Lockheed team experienced delays developing the navigation payload and incurred further delays after a testing mistake. The GPS III program is now 35 percent over budget and almost three years behind schedule, according to Cristina Chaplain, who leads oversight of military space programs for the Government Accountability Office. She spoke June 16 at the Strategic National Security Space FY18 Budget Forum sponsored by the Mitchell Institute for Aerospace Studies and Jacques & Associates/FiscalTrak. Air Force Space Command is now following through on a two-phase plan where it gave three firms contracts worth up to $6 million each to determine if there were "viable, low-risk, high-confidence sources" for the next round of spacecraft. In May 2016 it awarded deals to Boeing Network and Space Systems, Lockheed Martin Space Systems Company, and Northrop Grumman Aerospace Systems. The upcoming contract, however, is not limited to those three firms. While Phase 1 informed the government’s acquisition strategy, Air Force Space Command said in its July 10 announcement that "participation in Phase 1 is not a prerequisite to participation in Phase 2." And the choice is not just about money and schedule. In response to questions, Gleckel said the Air Force’s new satellites potentially could have "some evolved design (that is) perhaps radically different." In fact the chart at the top indicates the contract award will be followed by a Critical Design Review period of roughly a year. That CDR, the chart suggests, could include design changes. There already are plans to include an On-Orbit Reprogrammable Digital Payload (ORDWG) on SV11 as well as high power amplifiers and 18 decibels of additional power for regional military protection (RMP) of M-Code signals. There will also be an energized charged particle (ECP) sensor for increased space situational awareness, the planned search and rescue payload and a NUDET Detection System (NDS) that’s been redesigned to address obsolescence issues as well as reduce size and weight. There are also technology insertion points at SV17, SV23 and SV27. For SV17 and beyond the Air Force may add an enhanced M-Code Space Service Volume (SSV) for freedom of action in space, according to Gleckel’s chart. Directional laser crosslinks may be added starting with SV23. Air Force Space Command is also working with the Air Force Research Laboratory at Wright-Patterson Air Force Base on "new technology to increase resiliency and evolve to mitigate threats." According to the chart, delivery of SV11 is planned for the first quarter of FY26. The last satellite, SV32, is to be delivered in the second quarter of FY33. The new satellites would all be launched by FY33, he said, with "four-ish" launches per year. The Air Force does have one GPS III satellite in hand. The first of the 10 now under construction is in storage awaiting launch sometime next summer on a SpaceX Falcon 9 launch vehicle. Though the plan he outlined seems fully fleshed out, Gleckel stressed that nothing had been signed. "We’re not on contract with anyone for those satellites yet," he said. "This is notional. This is our strategy that we’re laying out." In fact the RFP process is still incomplete, an Air Force spokesperson noted in an emailed statement. "The intent of the GPS III space vehicle 11+ draft Request for Proposal is to solicit industry feedback on the proposed approach," said Capt. AnnMarie Annicelli. "The draft RFP and upcoming industry day will inform a final Request for Proposal."